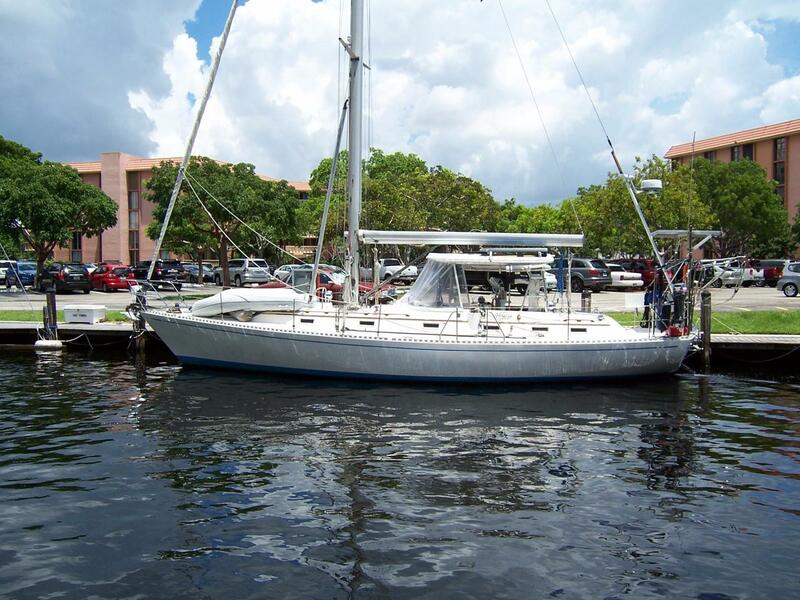 Hylas 44' 44 Center Cockpit Sloop 1987 Yacht For Sale | "Moon Taxi"
44' Hylas 1987 "Moon Taxi"
The Hylas 44' is a high quality cruising yacht with lovely lines drawn with a graceful sheer by renowned German Frers, providing exceptional performance with the ability to take you anywhere in the World. 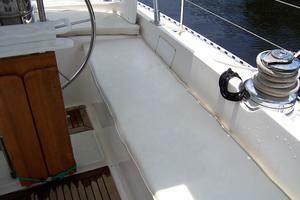 Her fine fit and finish is a result of the exceptional quality of the Queen Long yard, where the Hylas is built, and features a low center cockpit, wide side decks, a comfortable interior and excellent sailing performance. 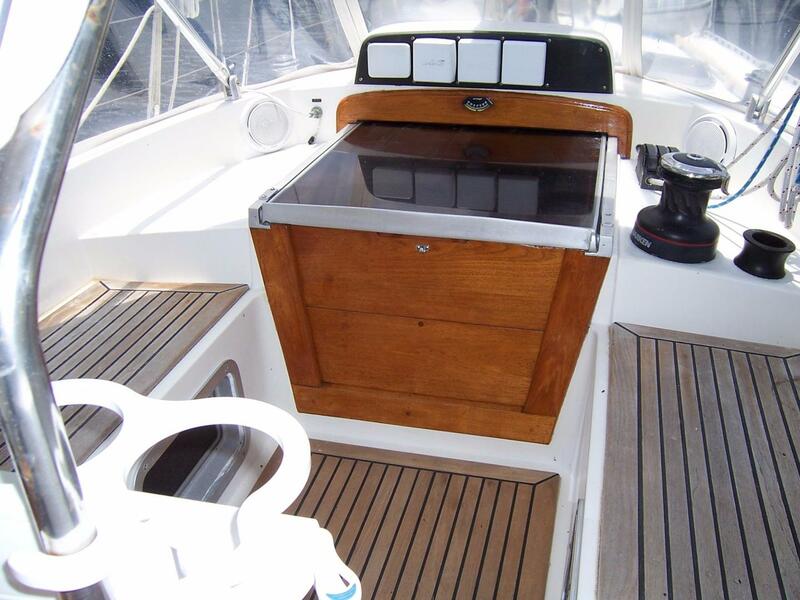 Her solid teak interior features highly detailed louvered locker fronts and dovetailed drawers, beautiful workmanship by her builder. 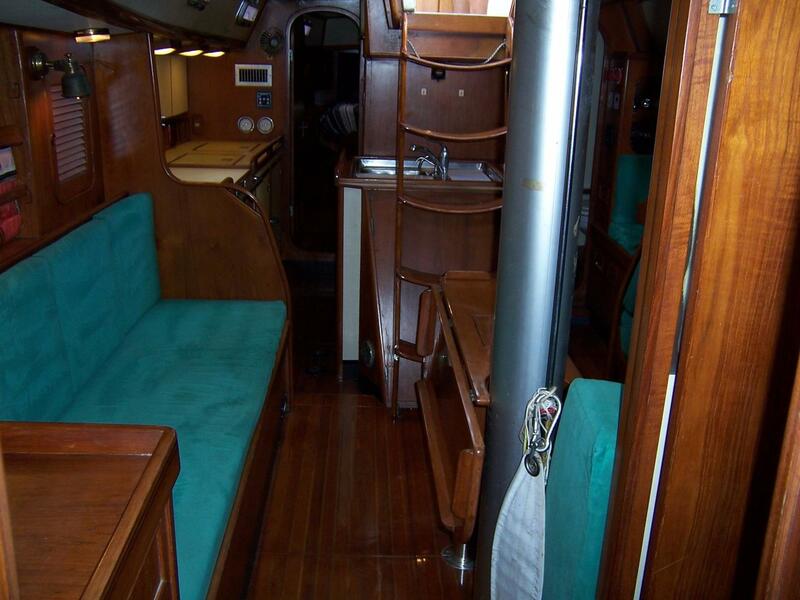 Two spacious staterooms, a large salon with drop leaf table and a walk through galley provide exceptional interior living space - far larger than most of her contemporaries. 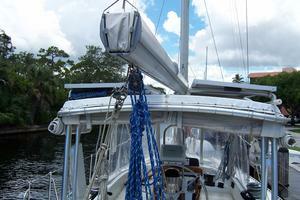 The Hylas 44 can easily do the Intracoastal Waterway with its 63'5" mast clearance off the water. 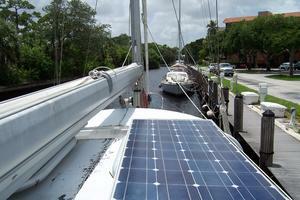 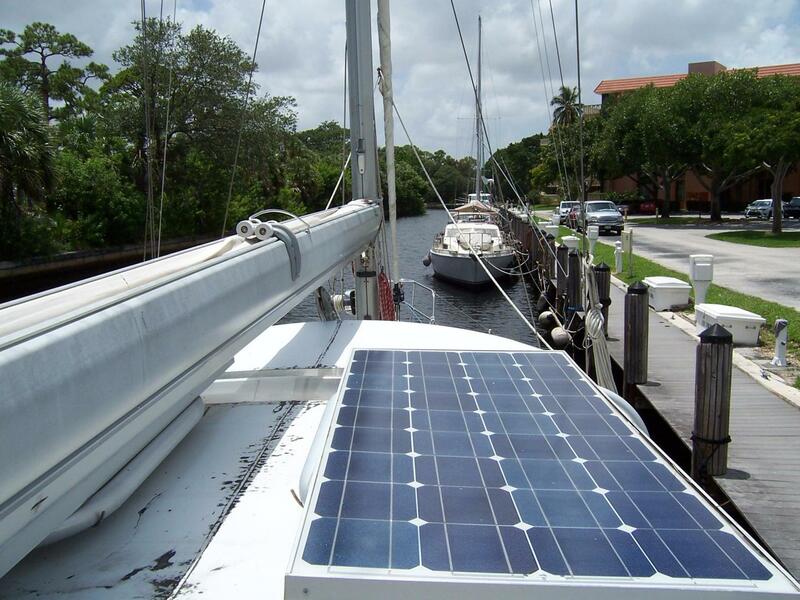 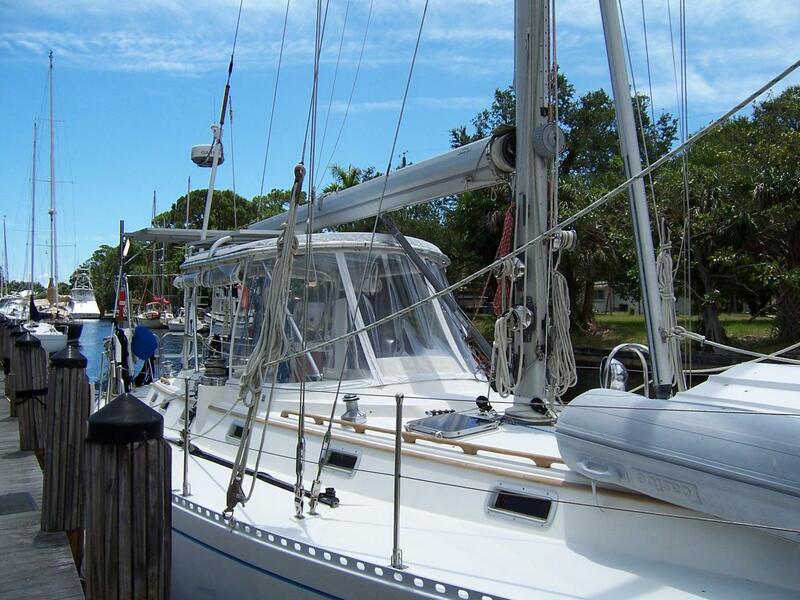 “Moon Taxi” is a perfect live-aboard or long term cruiser and ready for Caribbean cruising now. 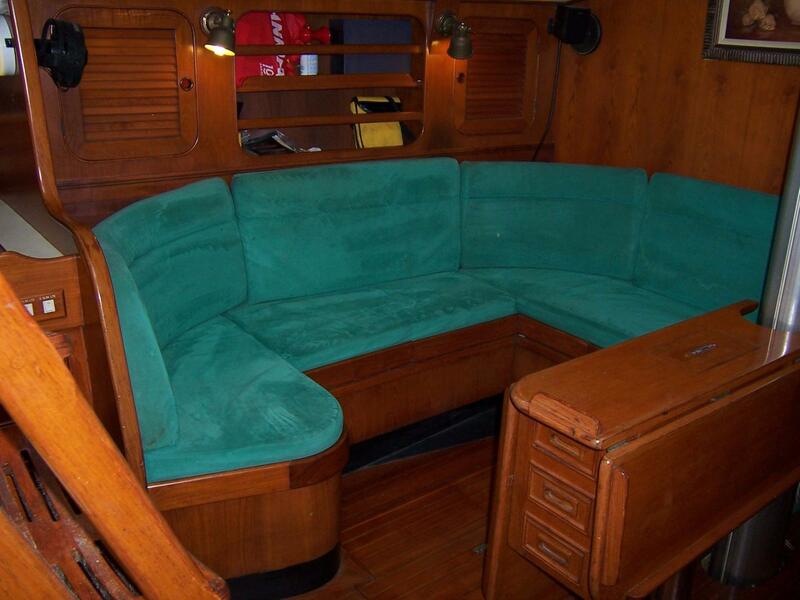 Accommodations Entry is into the main salon featuring a U-shaped settee that comfortably seats six around a drop leaf table. 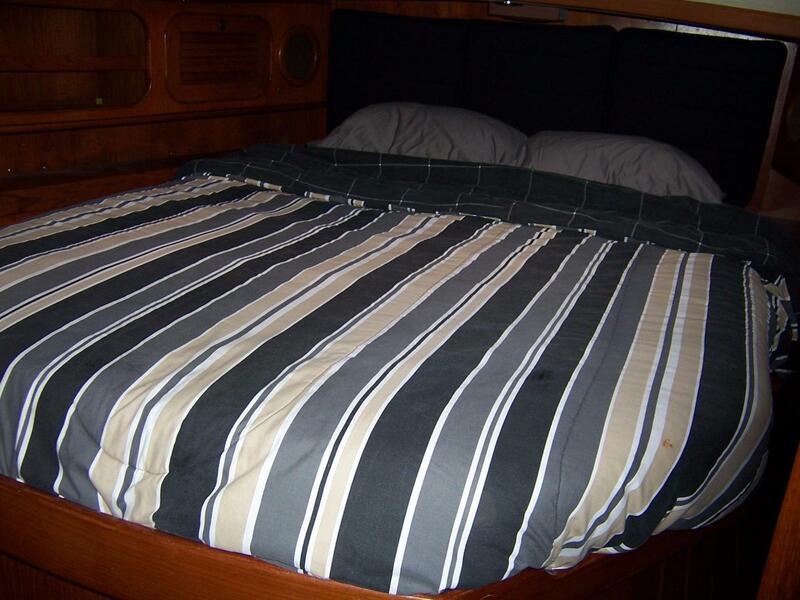 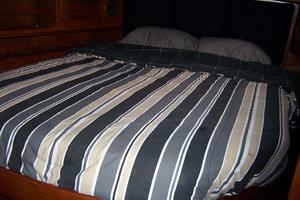 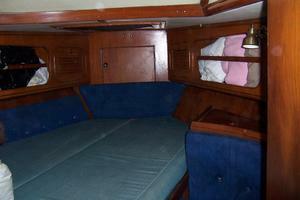 Across to starboard is a fore and aft settee designed to convert to a large double berth. 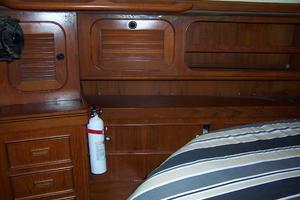 Teak lockers and cabinets surround this area. 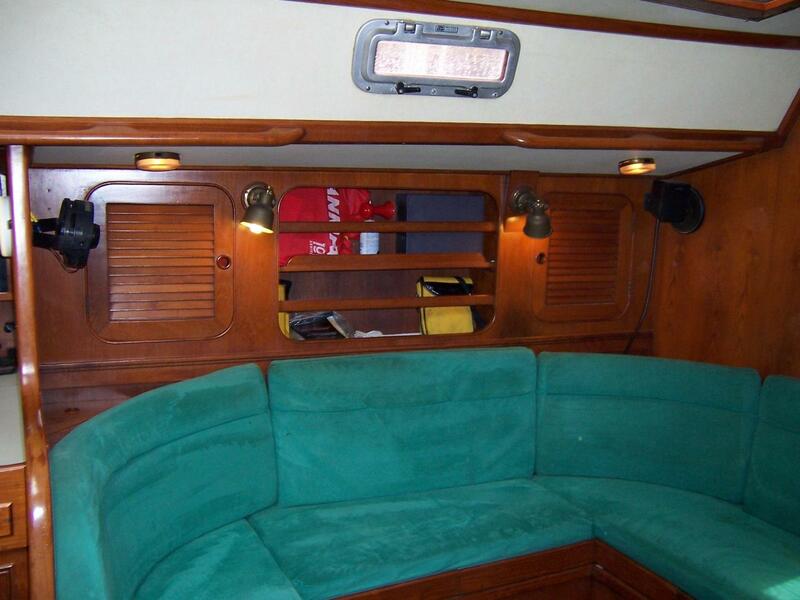 Storage is located behind the sea backs on both sides of the salon. 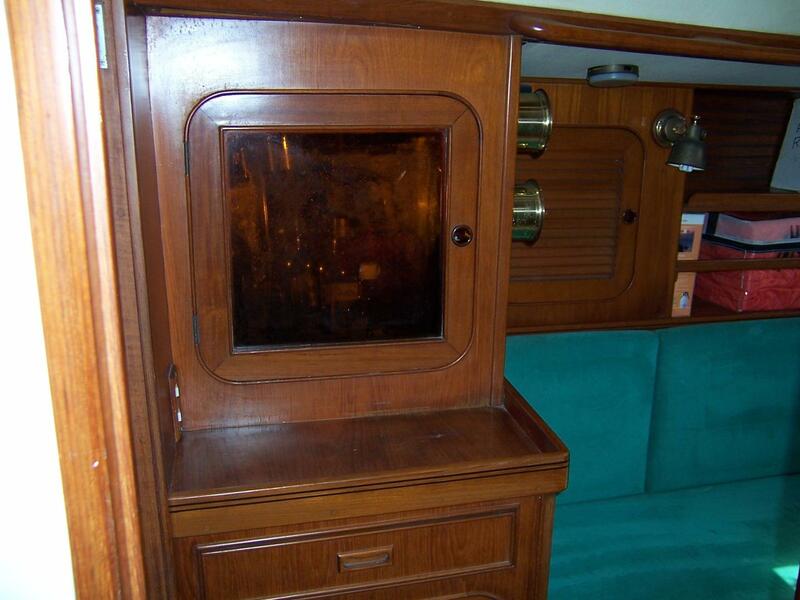 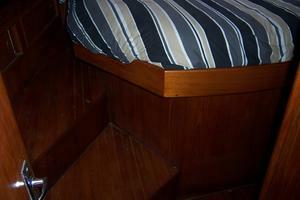 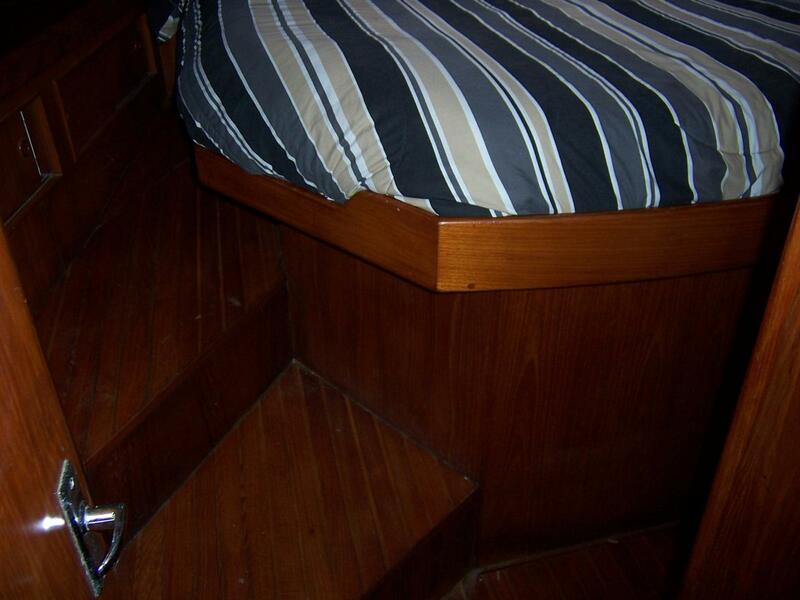 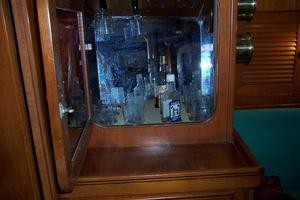 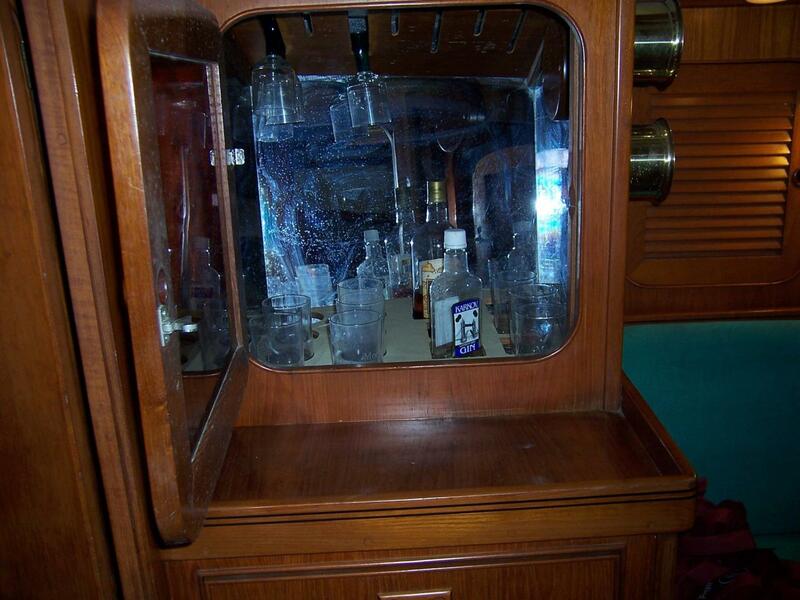 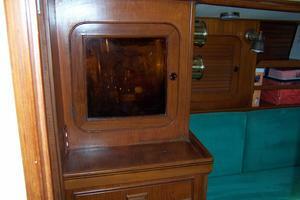 A liquor cabinet with storage below is to starboard and forward of the settee. 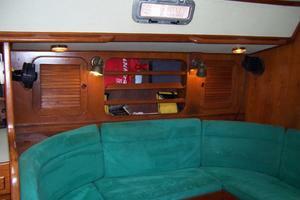 The head is accessible to port from the salon area. 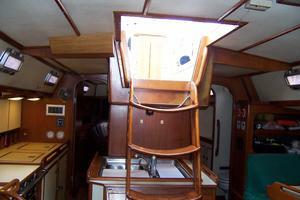 Two opening hatches and large fixed windows make the salon bright and airy. 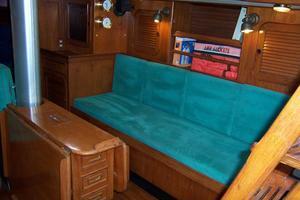 Forward to starboard is a straight settee and to port is a U-shaped settee with folding dining table. 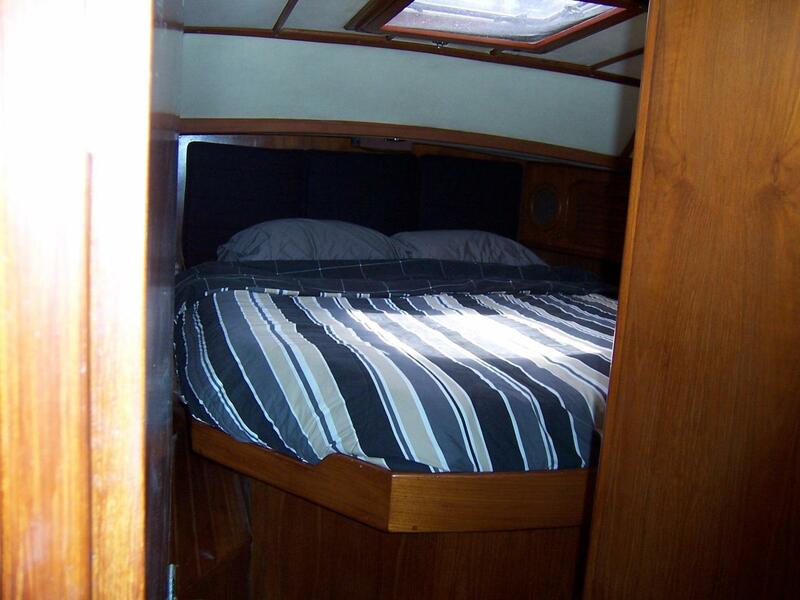 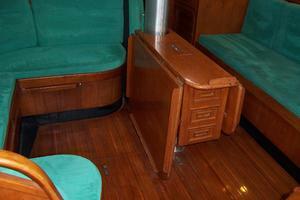 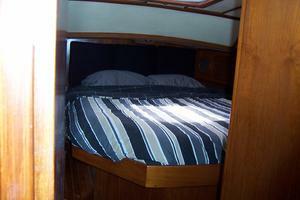 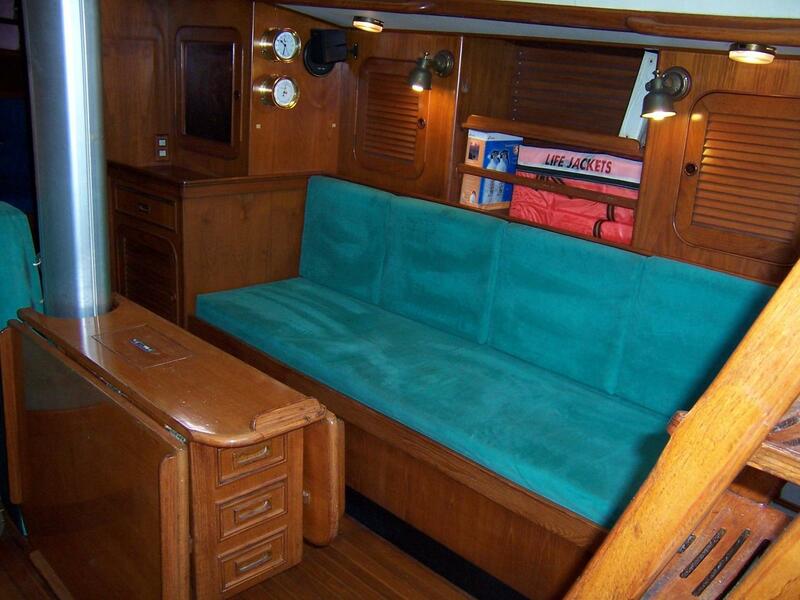 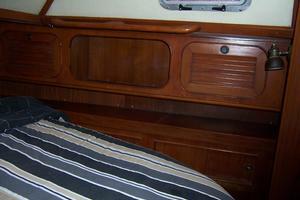 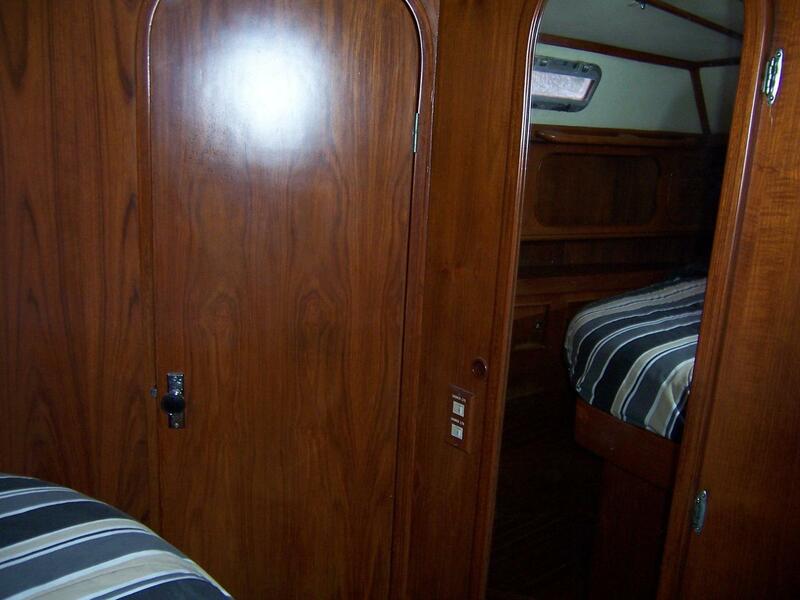 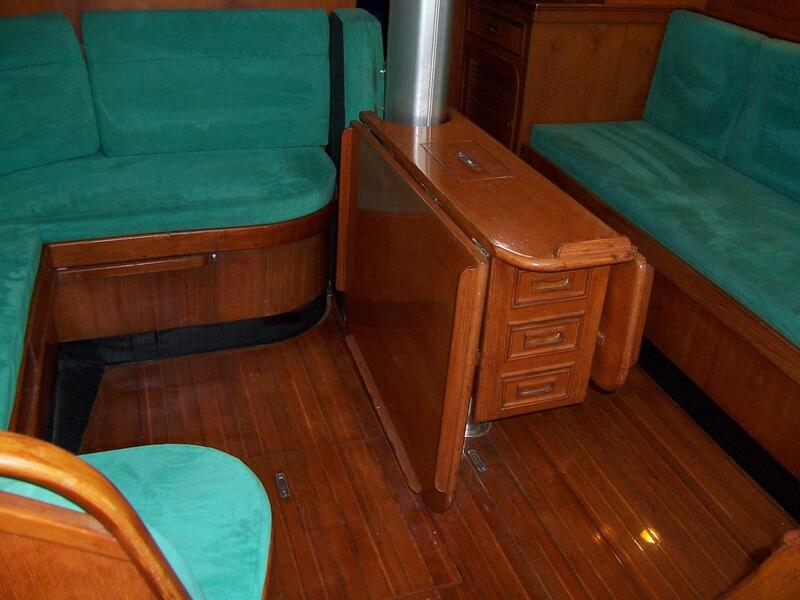 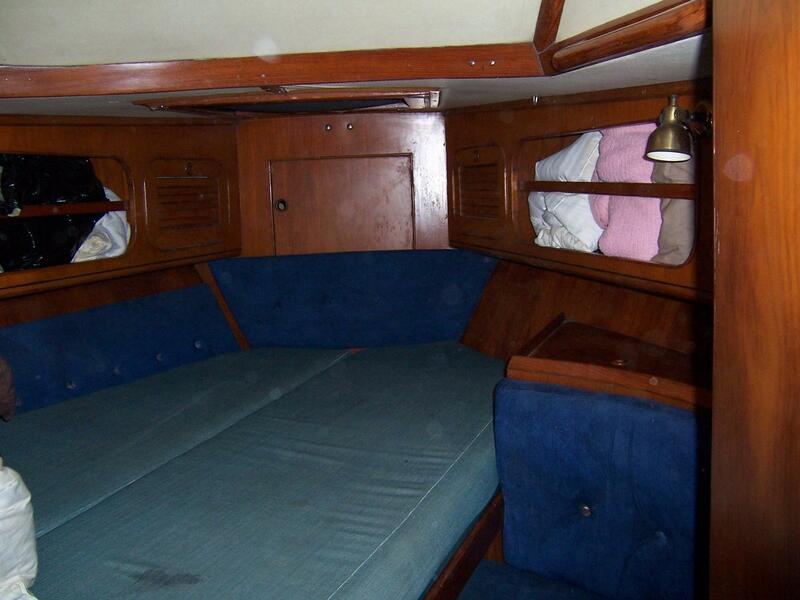 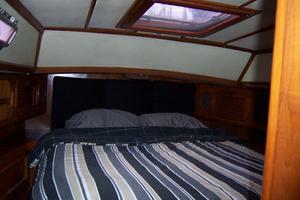 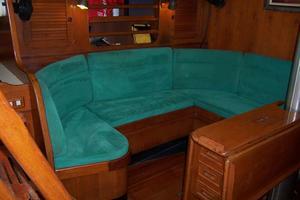 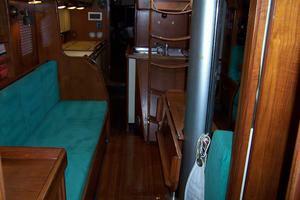 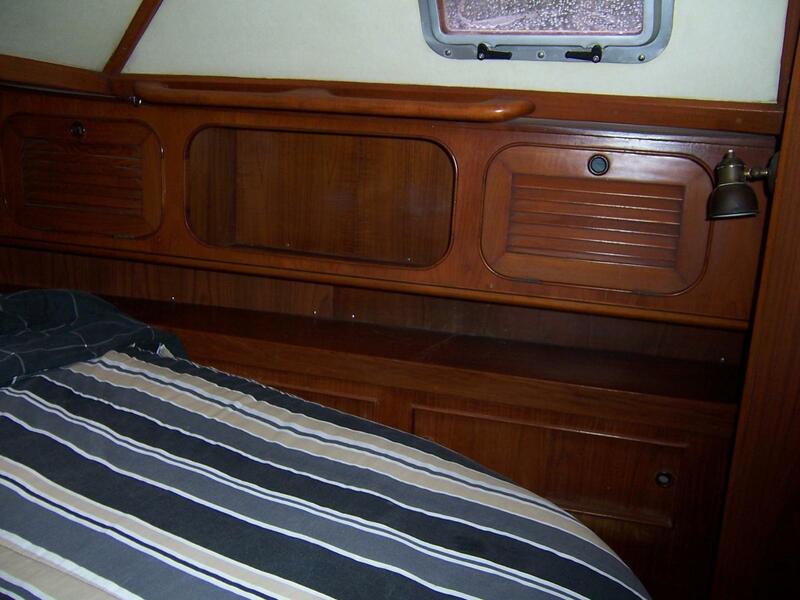 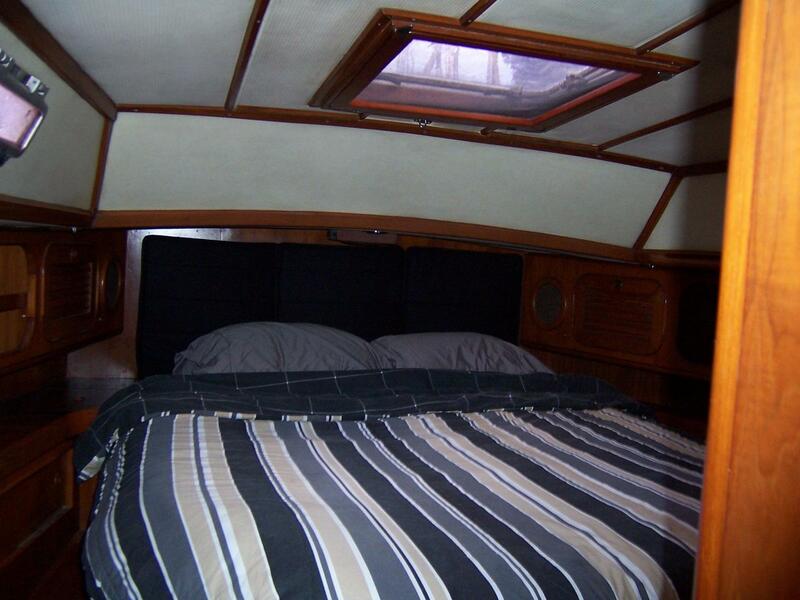 Storage is outboard above the settees, and the settee converts into a double berth. 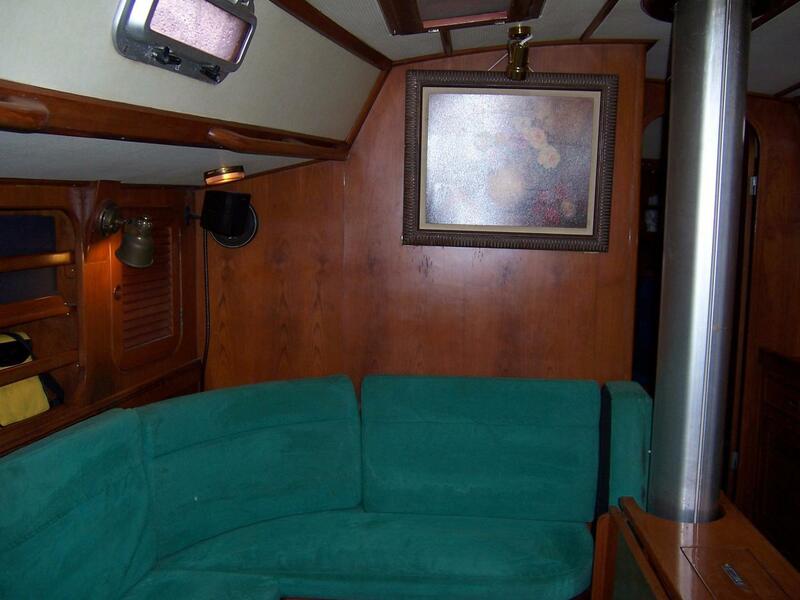 Headroom is 6'4". 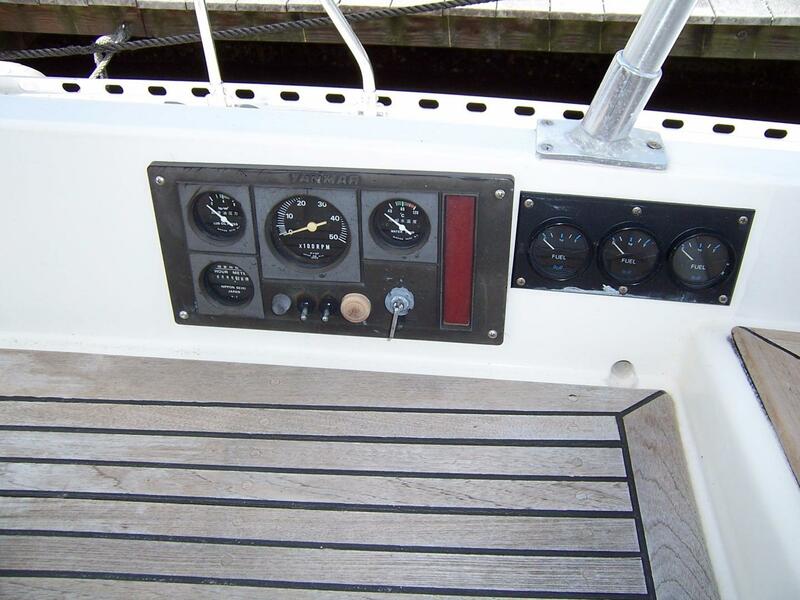 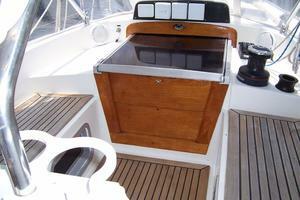 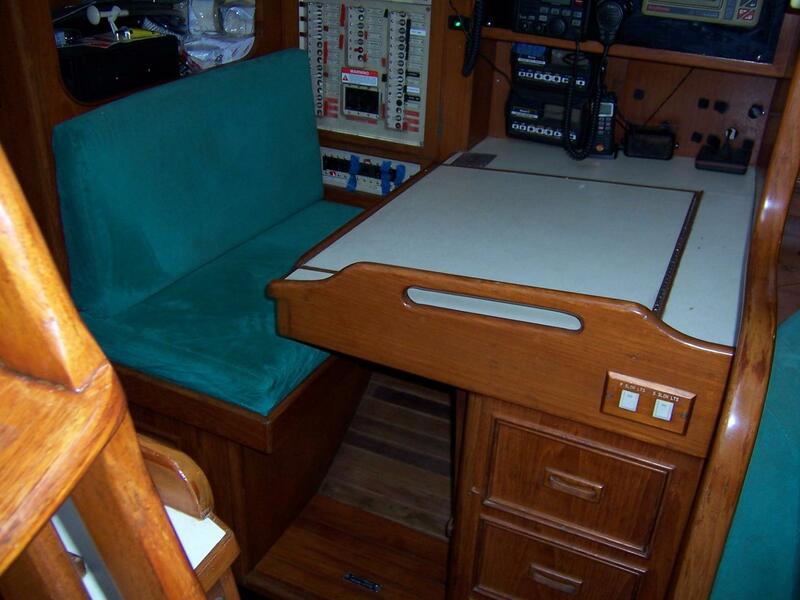 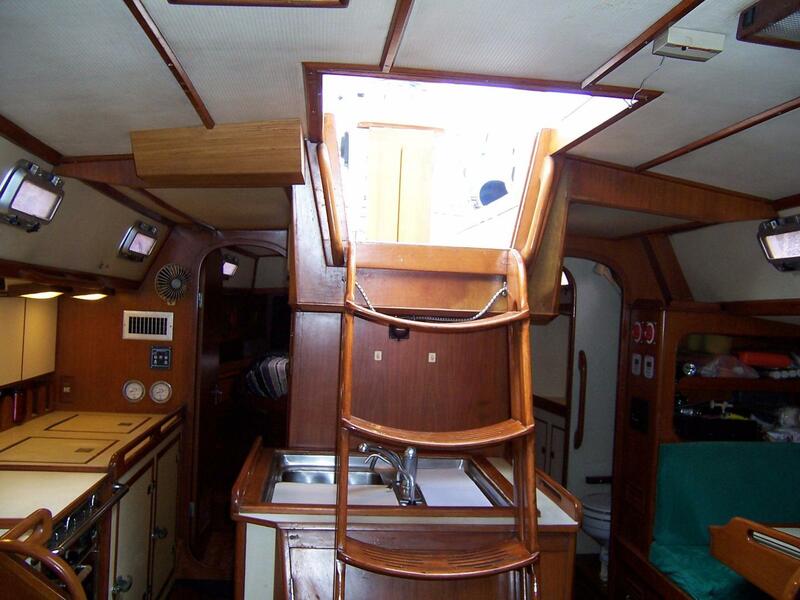 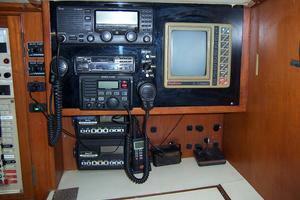 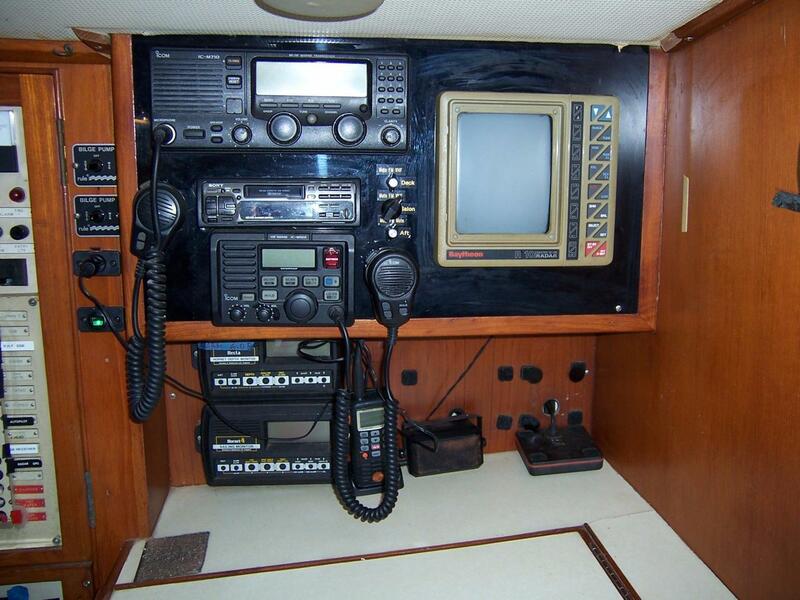 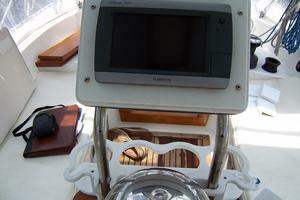 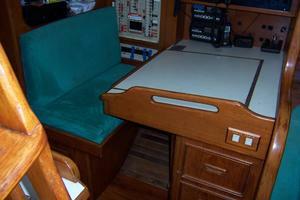 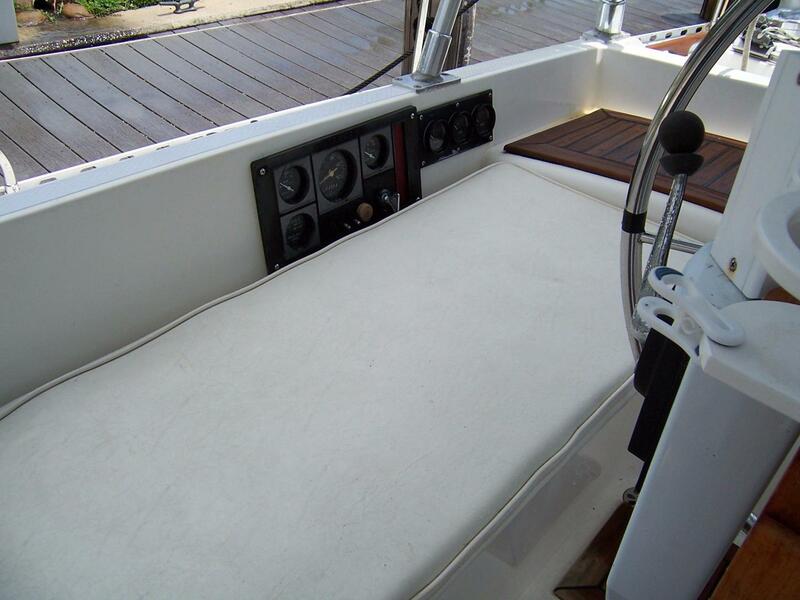 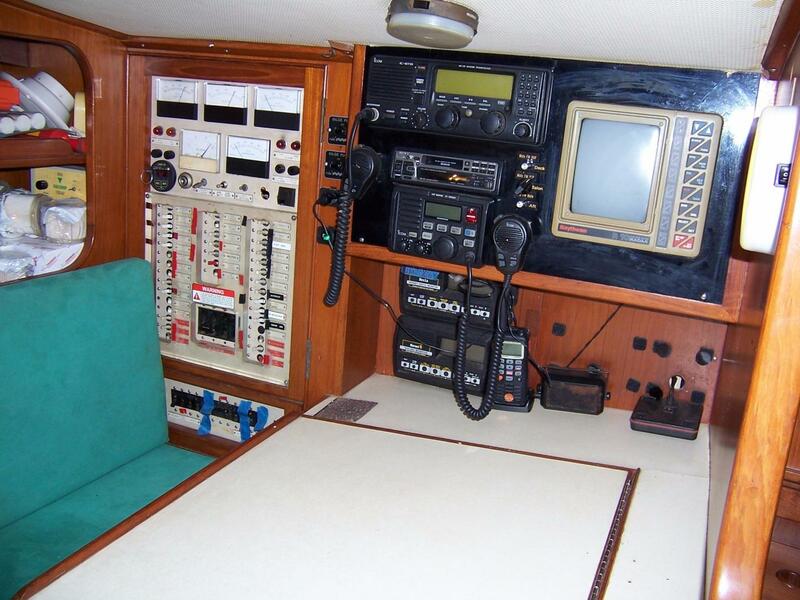 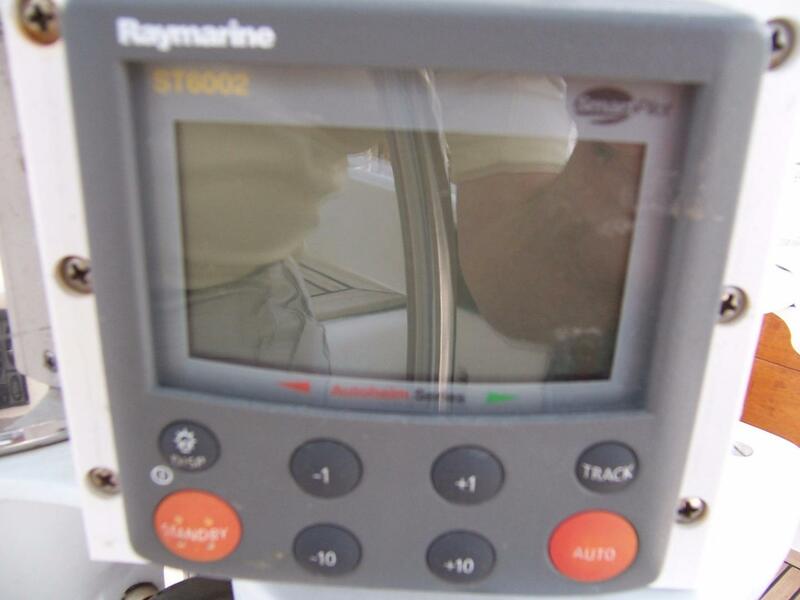 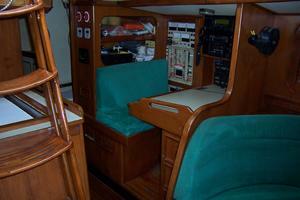 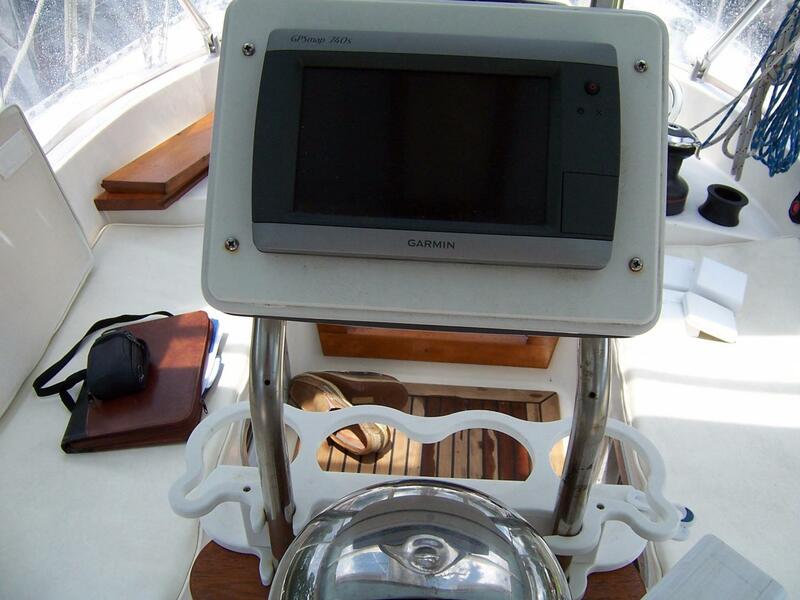 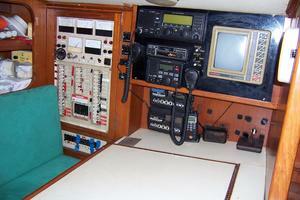 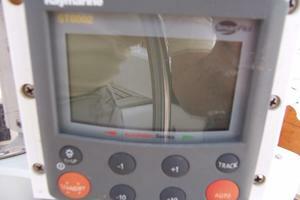 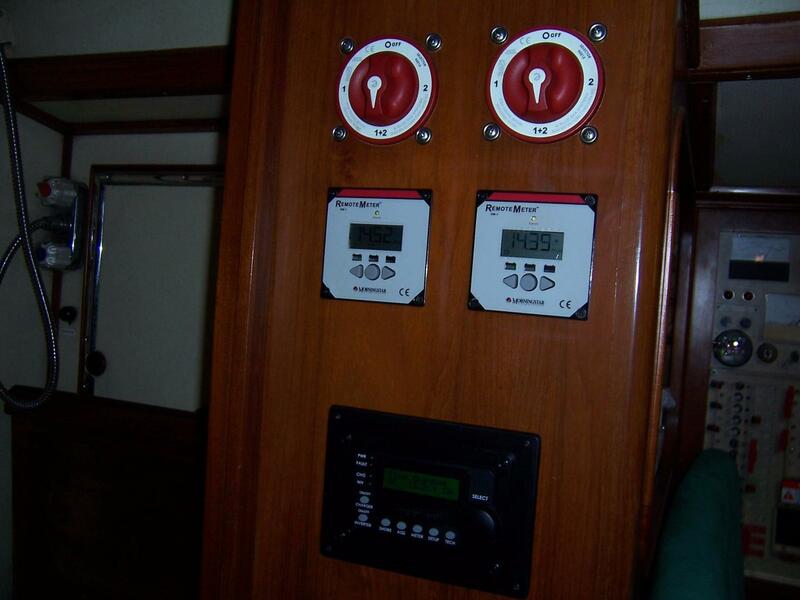 Aft to port is a navigation station with chart table, seat and storage. 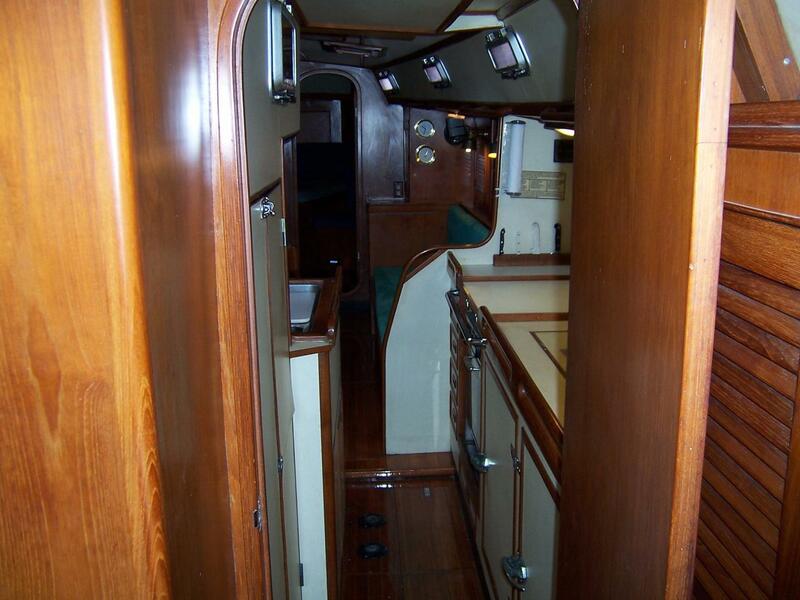 Aft to starboard is a long walk-through galley. 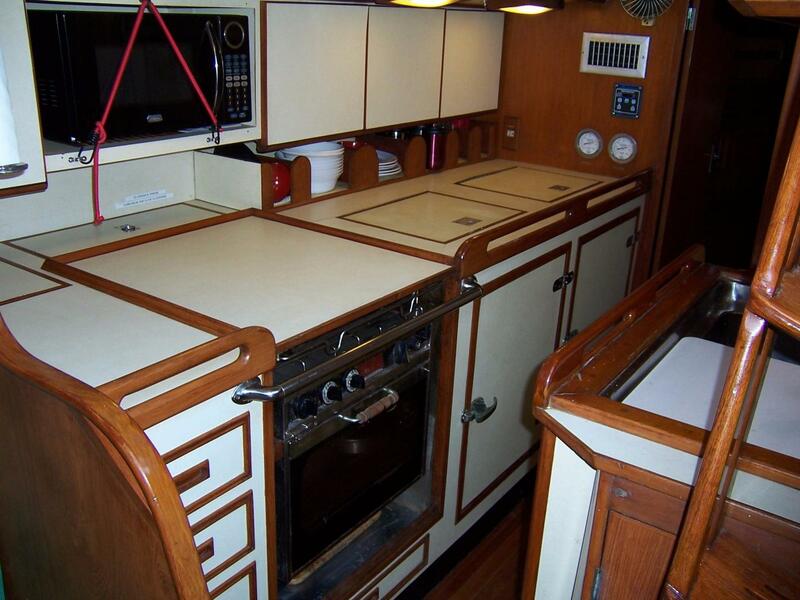 The galley is equipped with 3-burner Mariner propane stove with oven, microwave, Seafrost 12v refrigeration and freezer, and double stainless steel galley sinks. 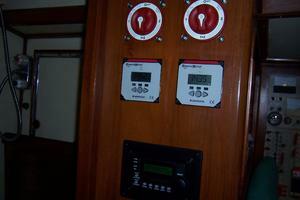 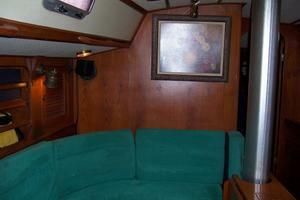 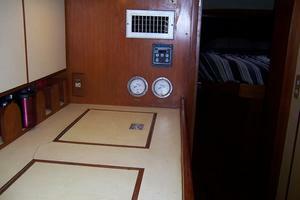 The master stateroom is aft and is accessed to starboard via the galley. 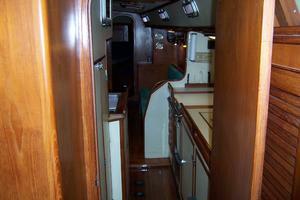 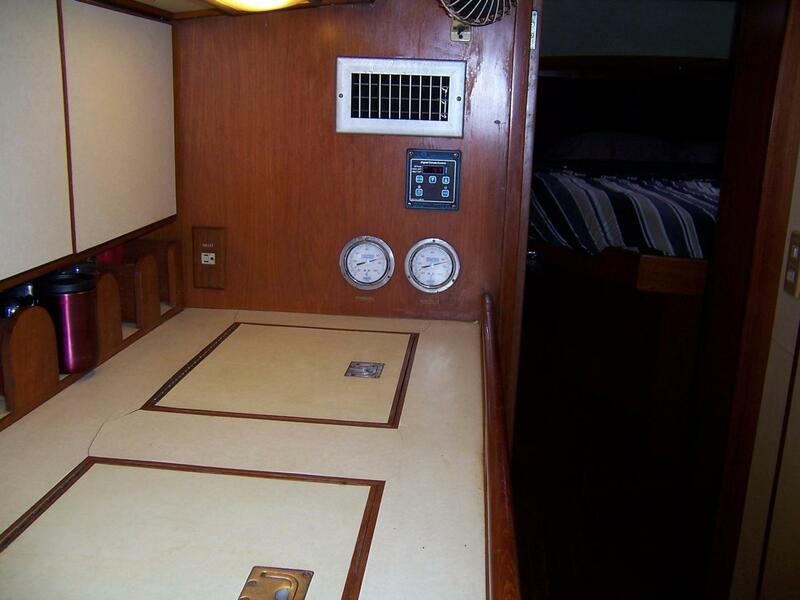 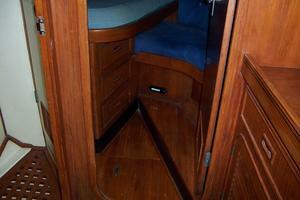 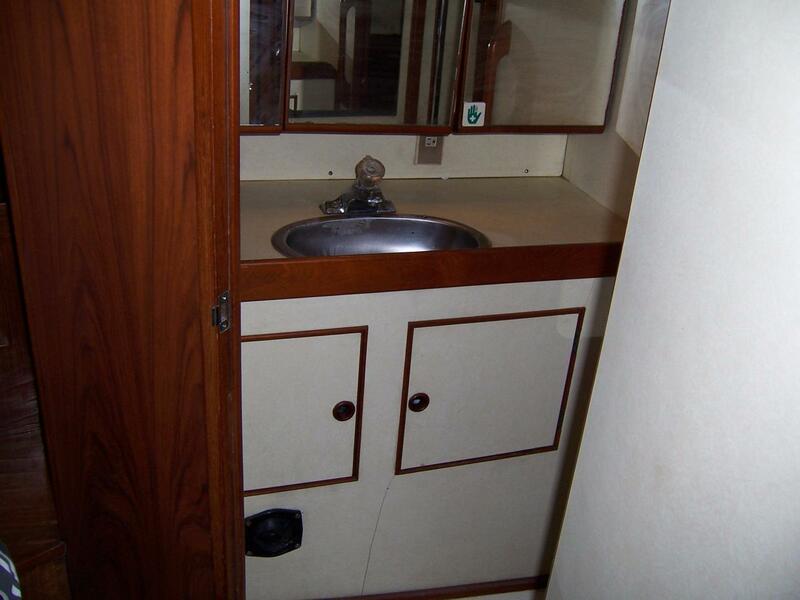 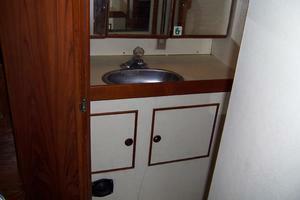 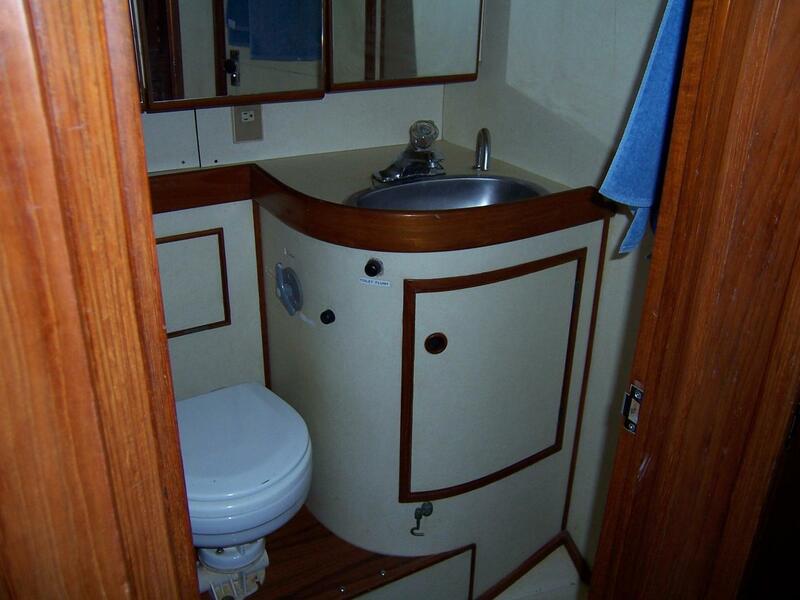 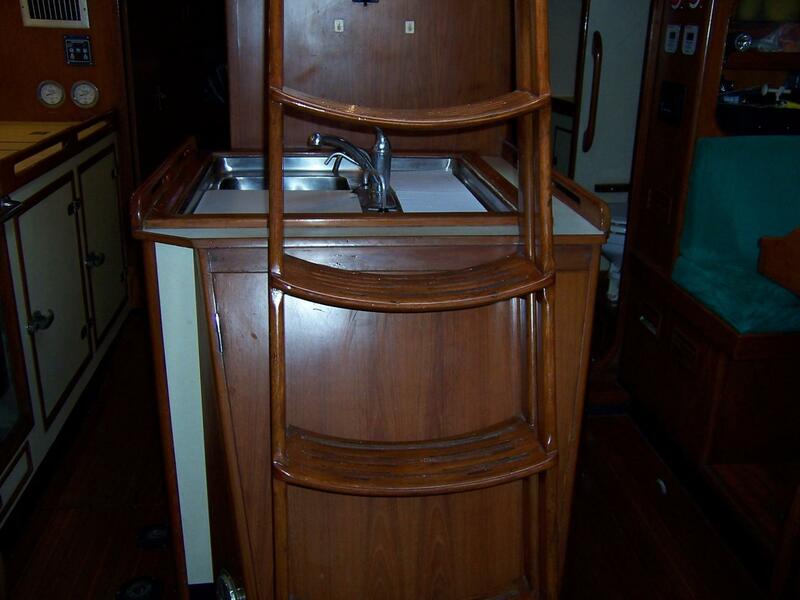 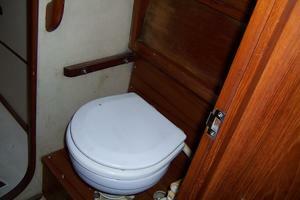 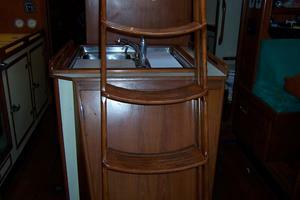 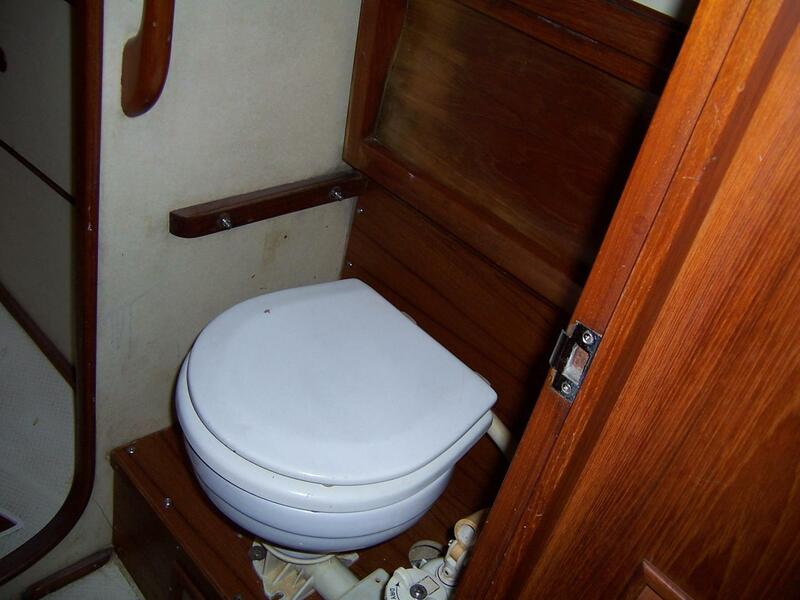 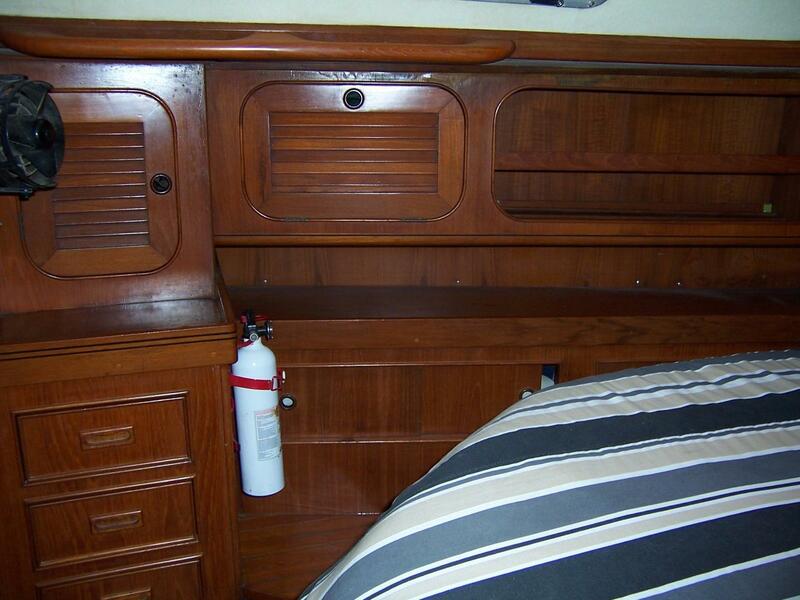 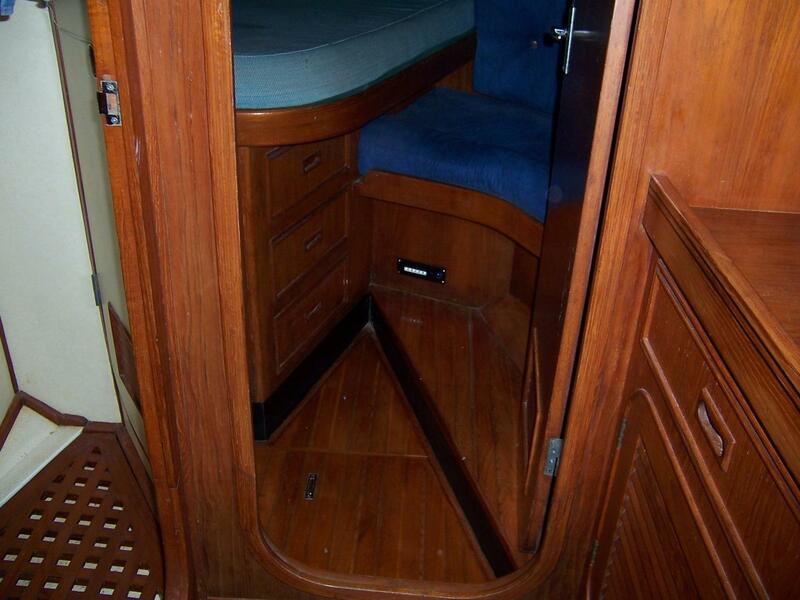 There is a centerline queen berth with hanging locker and storage. 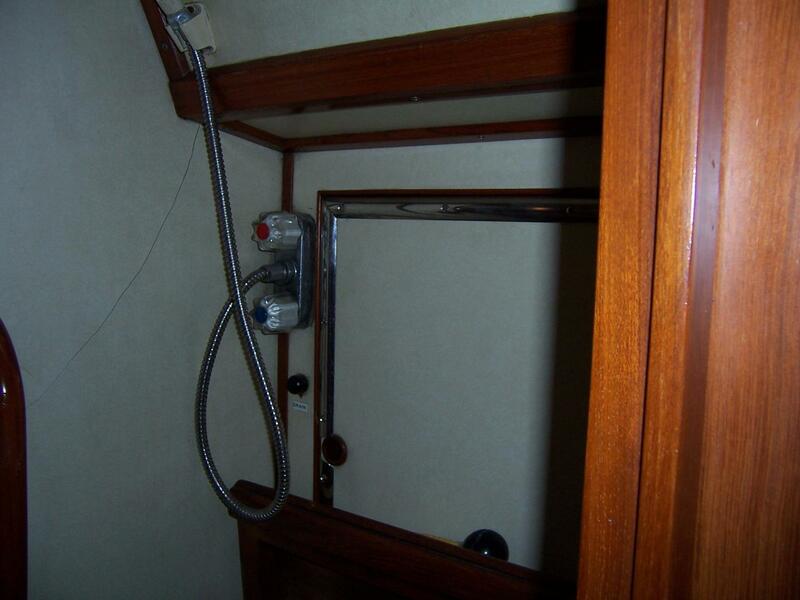 There is a private aft head to port, and its separate shower stall can also be accessed from the navigation station area. 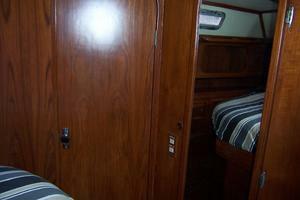 Forward is the guest stateroom with double berth, hanging locker and storage. 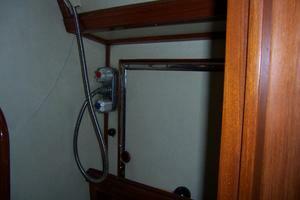 There is a head with shower forward. 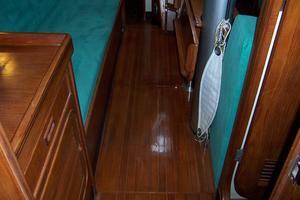 Sail Area = 864 sq.ft. 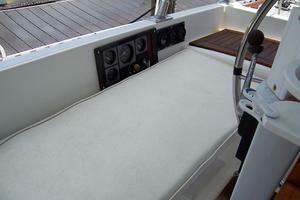 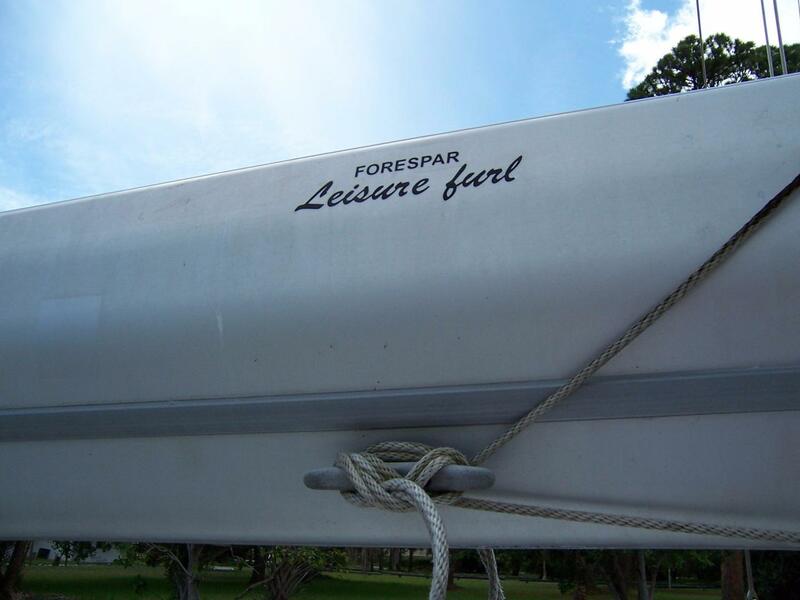 Construction & Finish The hull is crafted of hand laminated fiberglass with sandwich core construction. 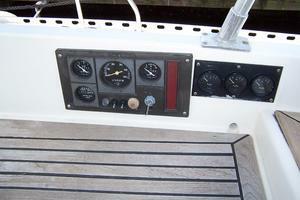 Fin Keel and skeg mounted rudder. 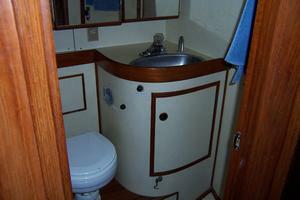 The hull and deck are white. 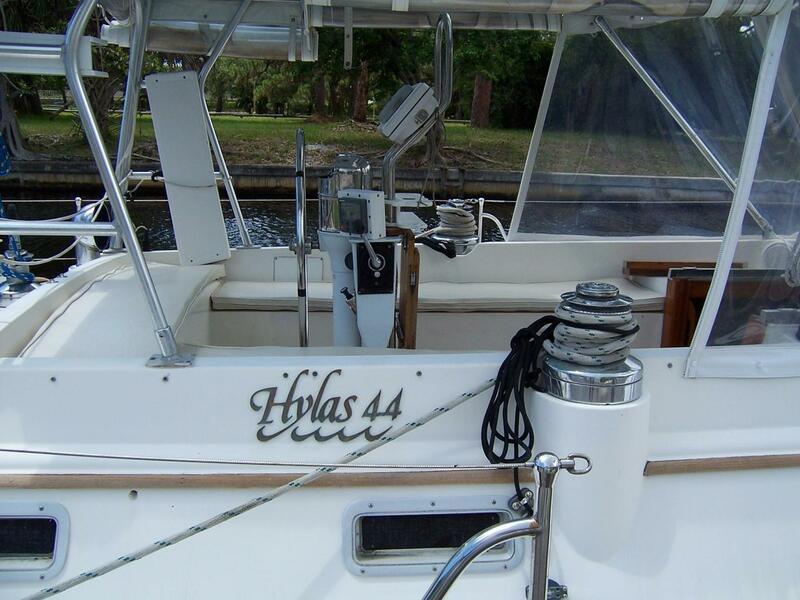 Comments The Hylas 44 has proven to be one of the best all round cruisers in the mid-40's size range. 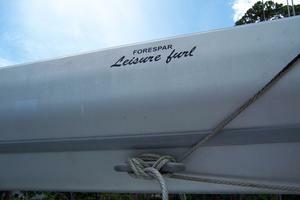 It is a fast, seaworthy sailor. 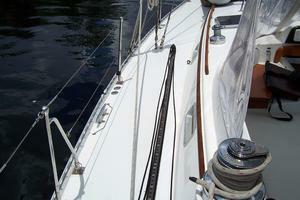 The lines drawn by renowned German Frers are lovely with a graceful sheer. 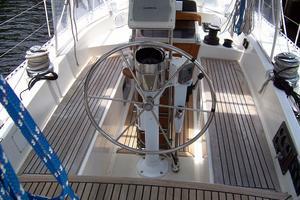 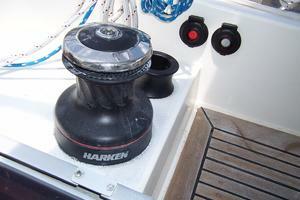 The 44s are very strong and rugged, and have logged hundreds of thousands of miles of offshore cruising. 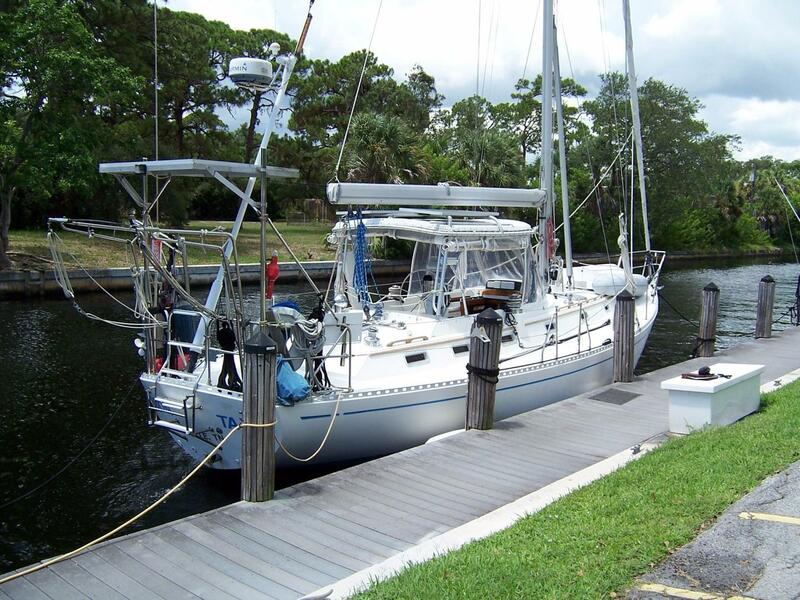 The comfortable two stateroom, two head interior, and large galley and salon result in an efficient offshore layout as well as a superb live-aboard and coastal cruiser. 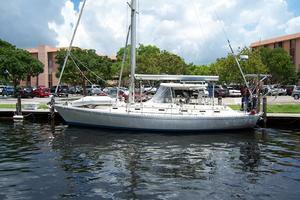 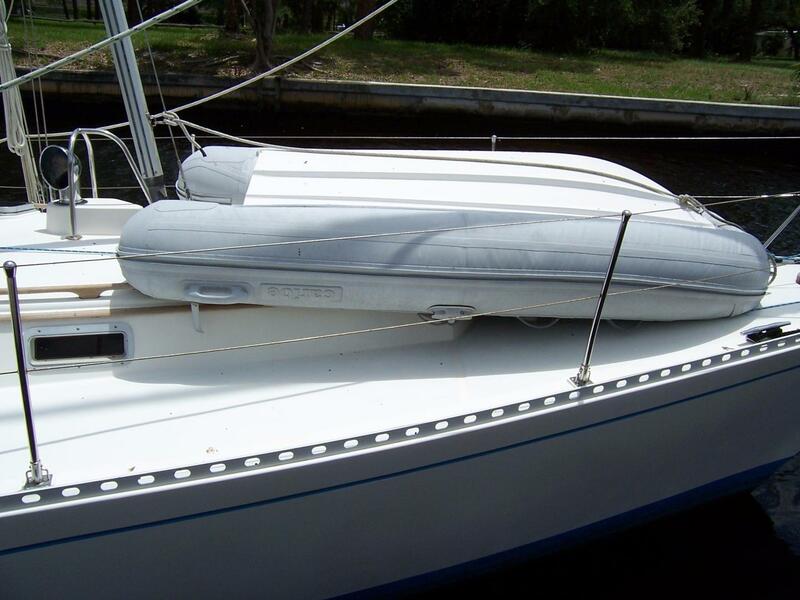 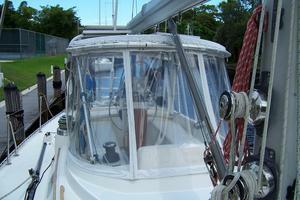 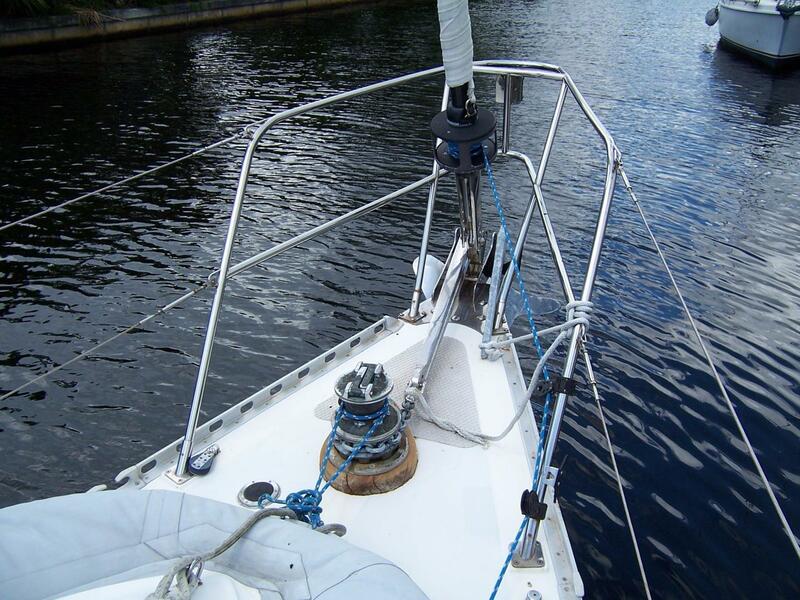 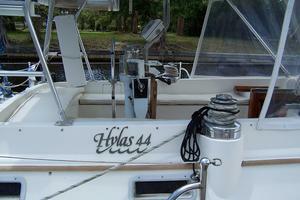 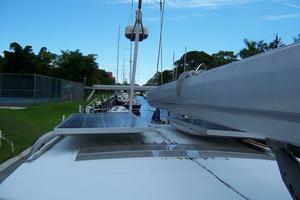 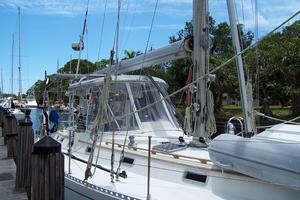 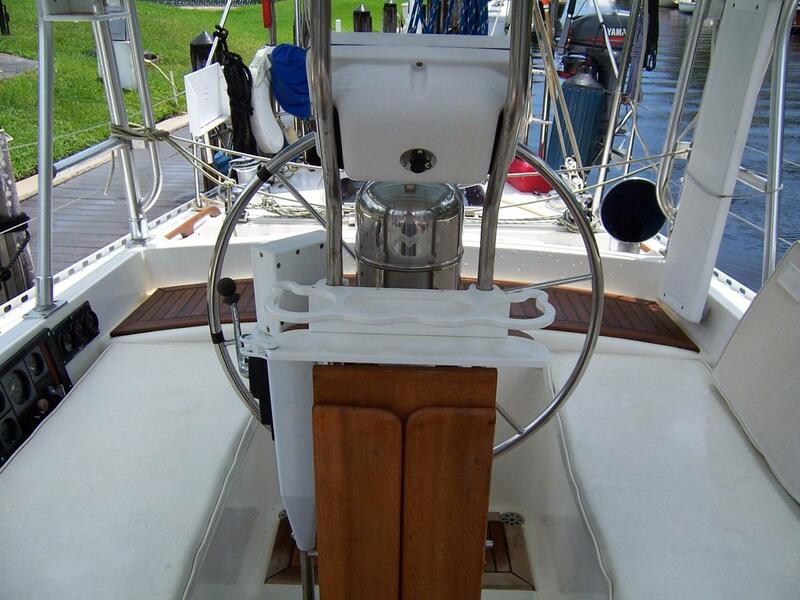 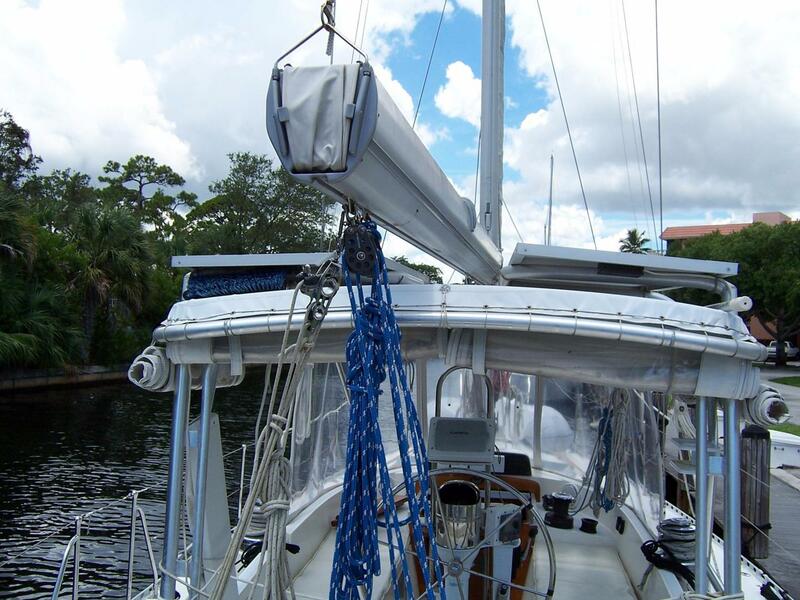 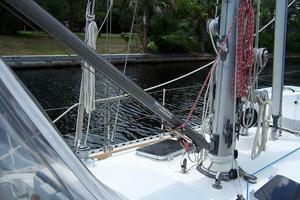 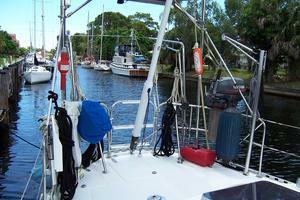 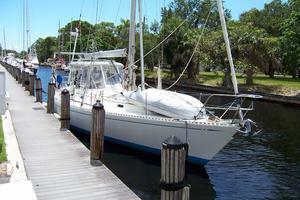 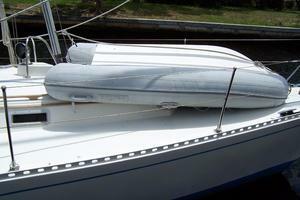 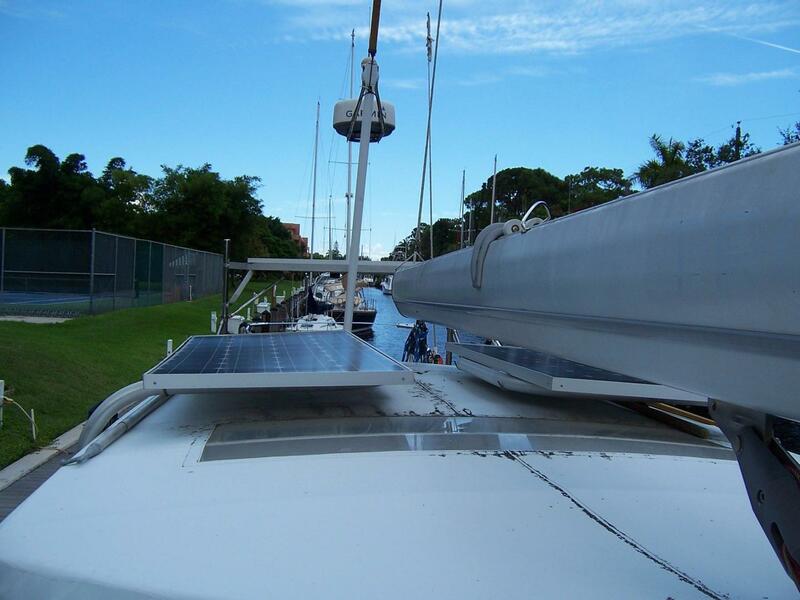 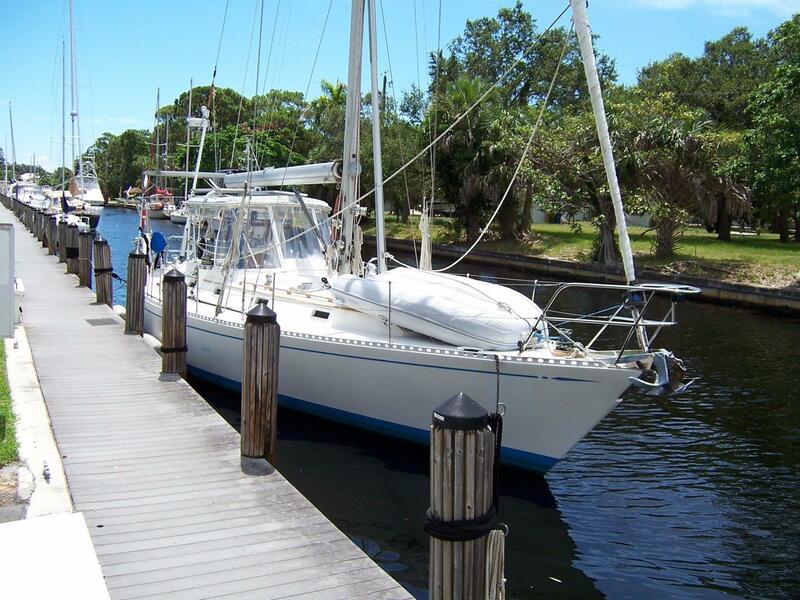 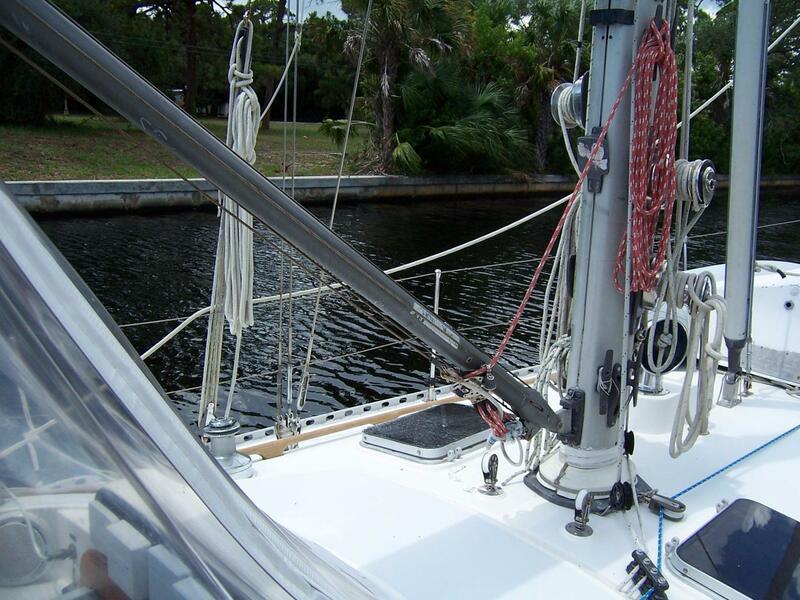 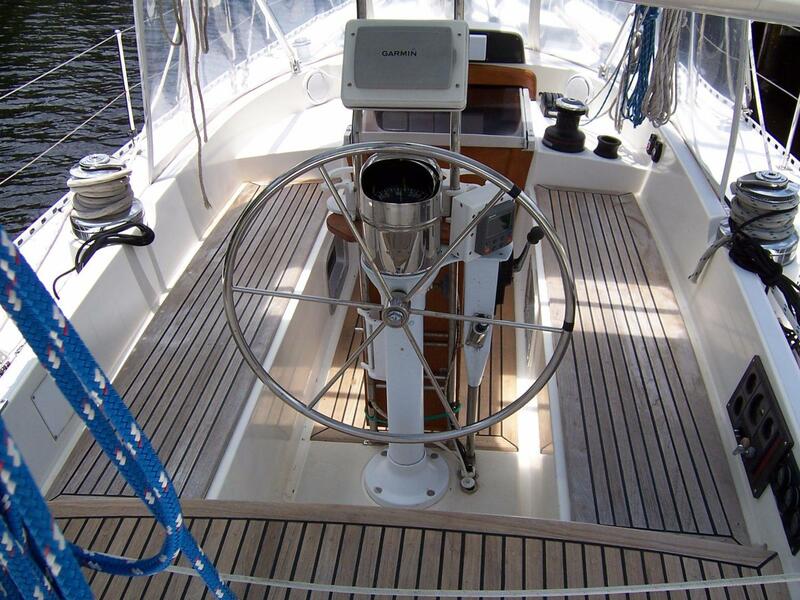 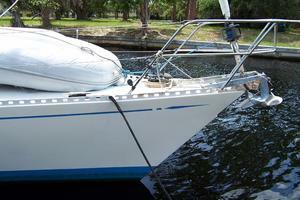 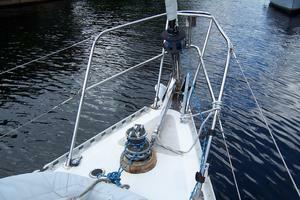 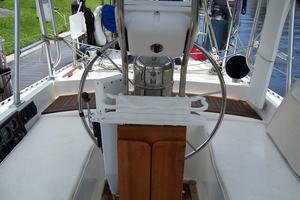 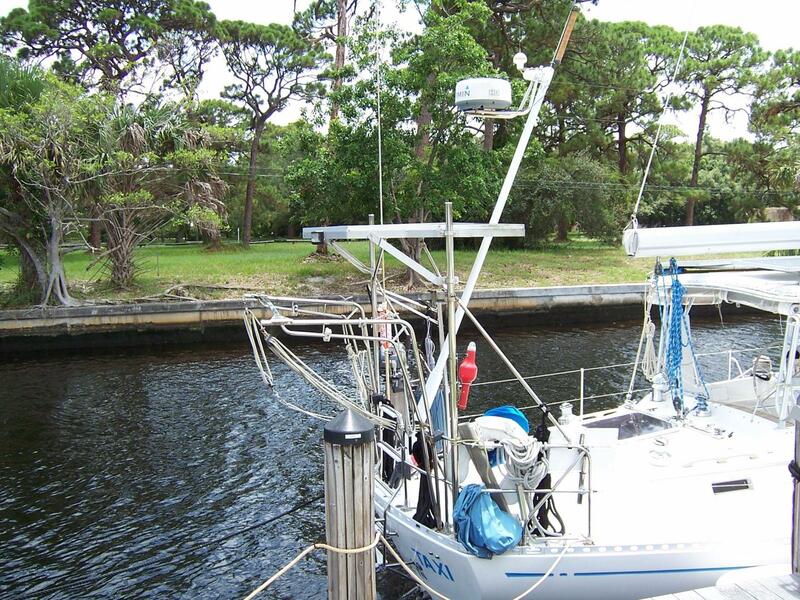 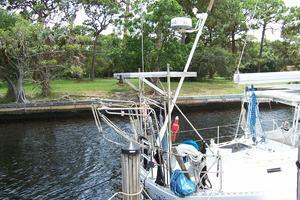 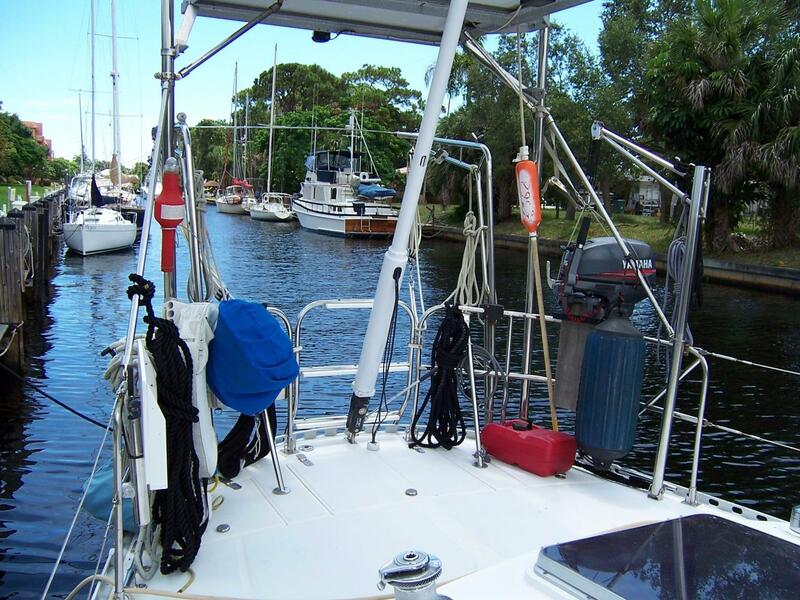 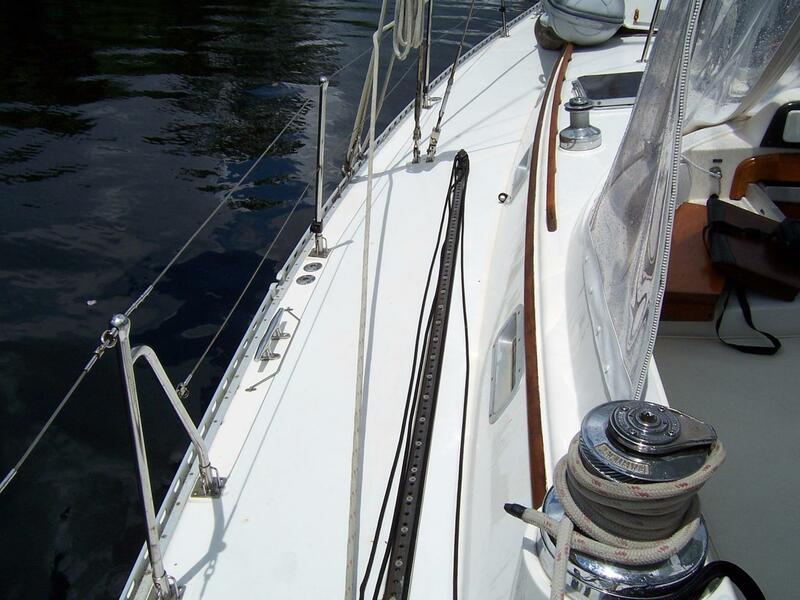 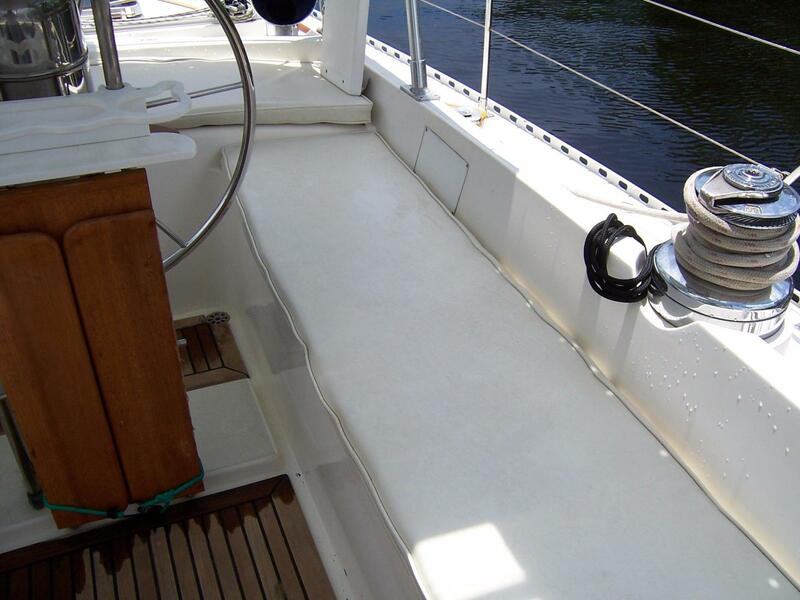 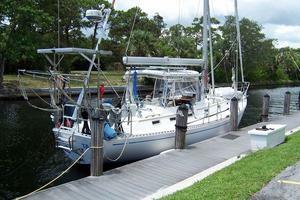 The Hylas 44 can do the Intracoastal Waterway with its 63'5" mast clearance off the water. 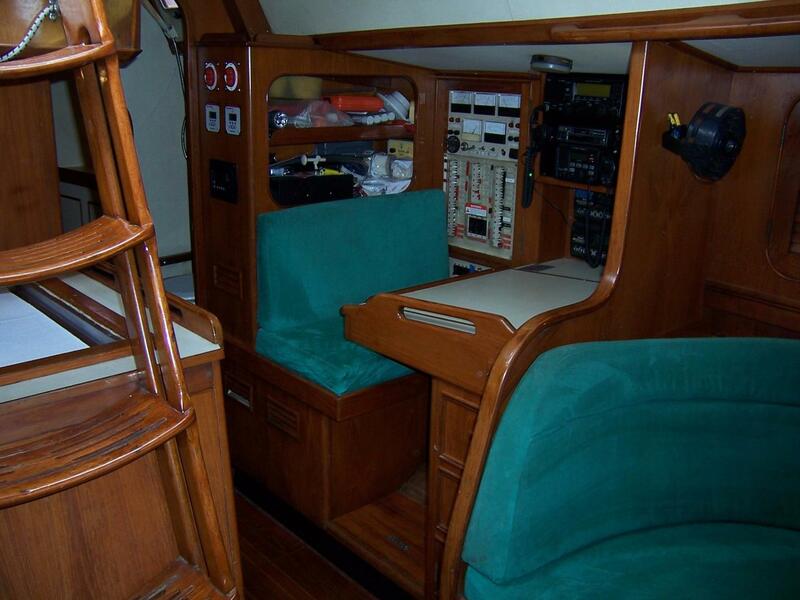 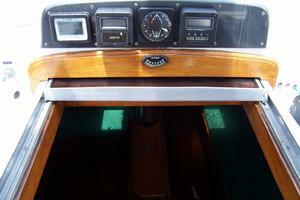 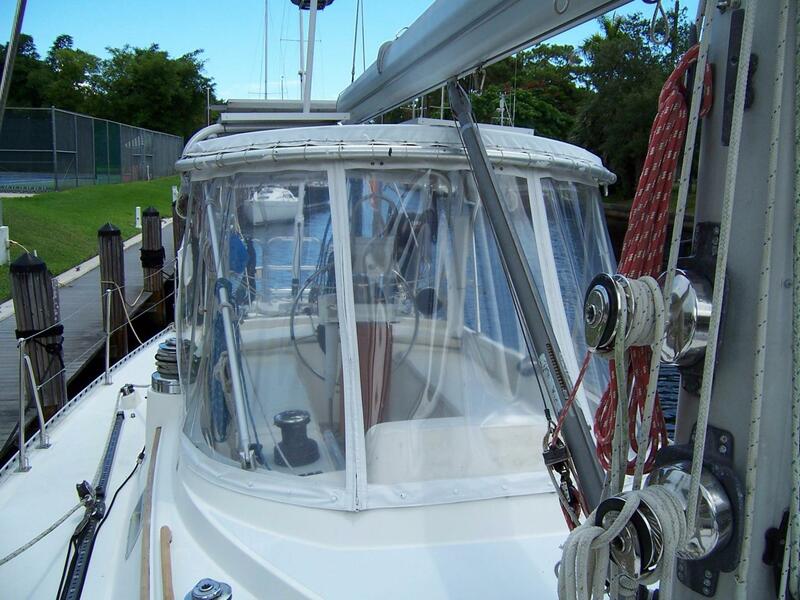 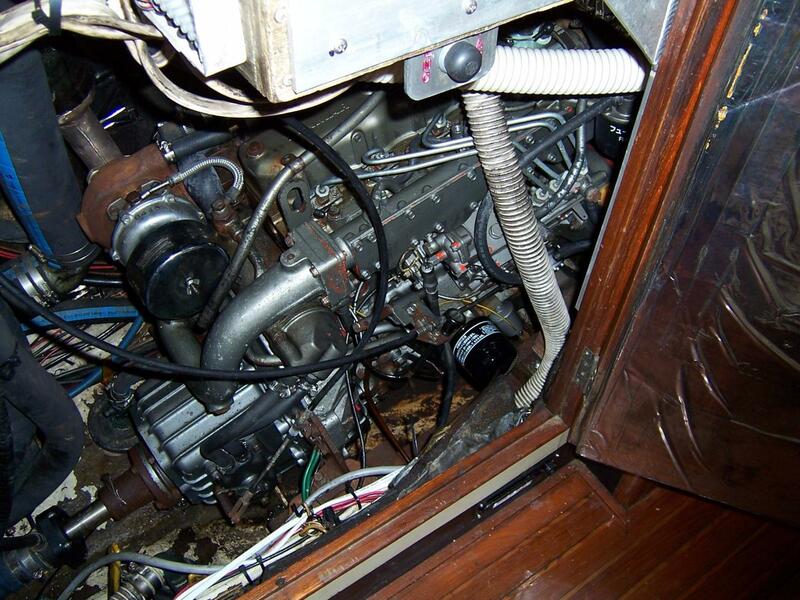 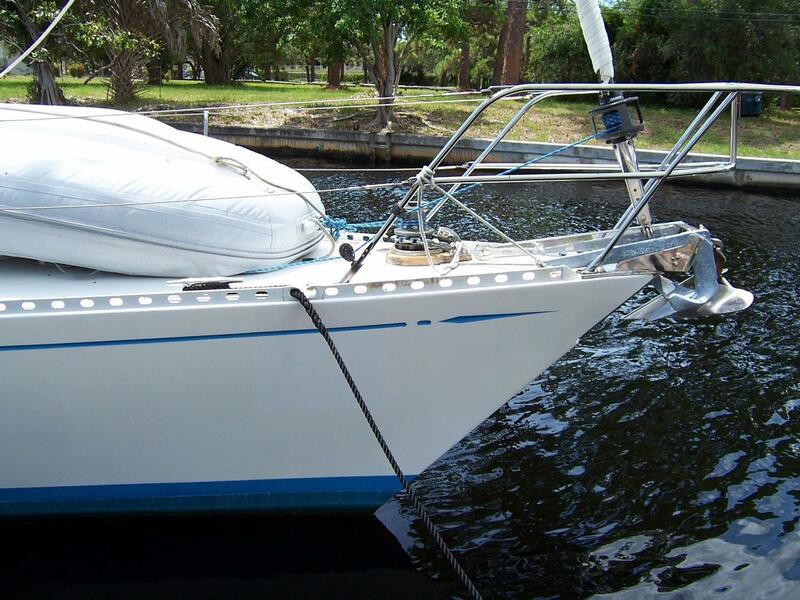 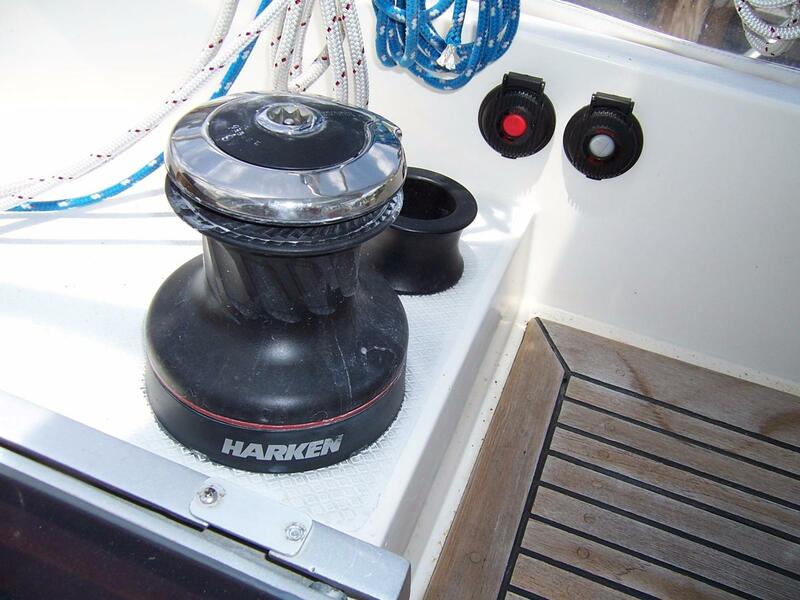 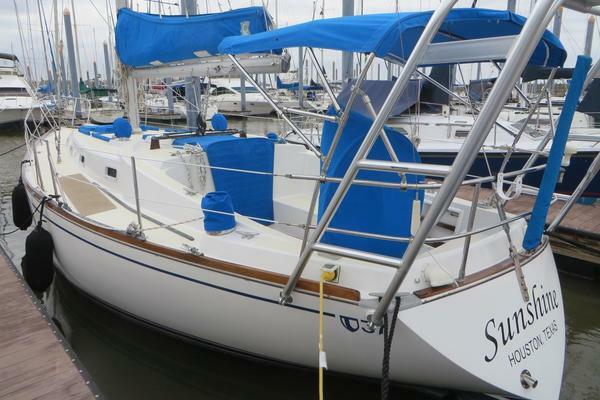 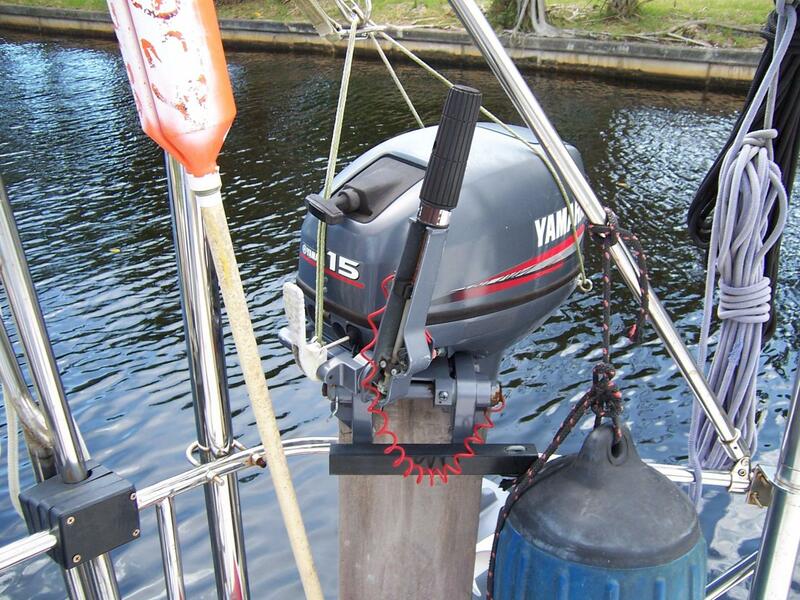 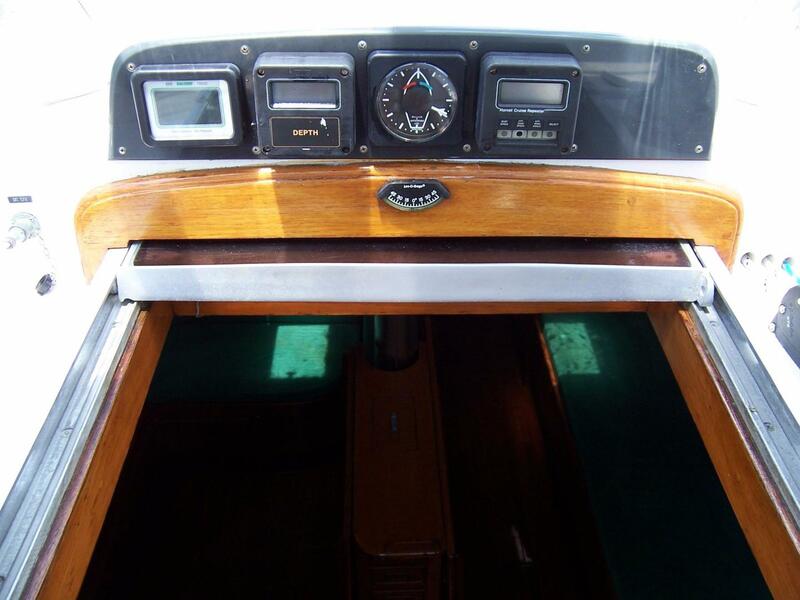 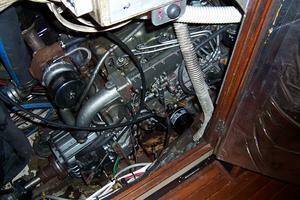 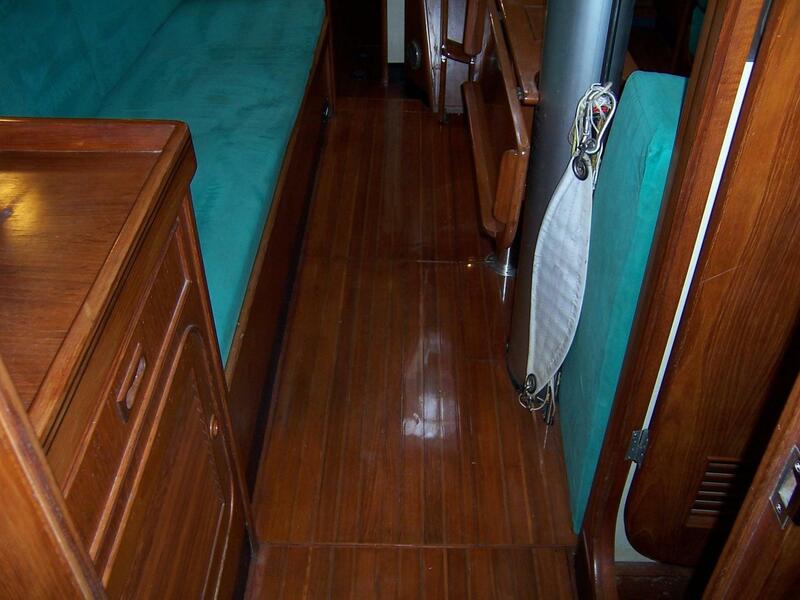 This 44 is fantastically equipped with nearly every extra and option that cruisers and offshore cruisers dream of.